This is part of a series called Getting Qualified Care, where we examine the anti natural birther movement of storming the internet to dispel what participants within feel are lies and misinformation about birth. We are discussing just what constitutes quality care from qualified providers, the subtext being “who gets to decide this” — mainly, would you allow other individuals from a movement with their own set of biases choose for you what your standard of care should be? What makes one “qualified”? Is it a prestigious educational background? Maybe it’s a rank or a title, like “Doctor”. Amy is Harvard educated AND a doctor. Impressive. Amy informs someone that college and medical background means you cannot disagree with them and possibly know what you're talking about. Interesting. Only a fool would disagree with a doctor! Here is Amy telling us a Doctor is wrong. 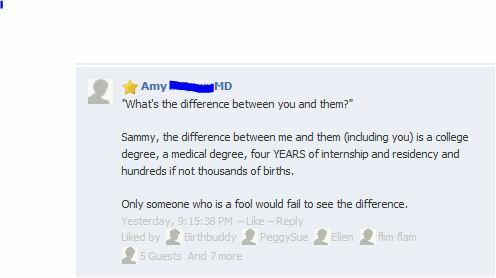 Here is Amy beginning to tell us that yet another Doctor is wrong. Don't want to ruin it for you, but, another wrong Doctor, according to Amy. I could go on, but I think you get the point– Dr. Amy, 5, Other Doctors, 0. Just one example of real-life anecdotes submitted to popular website My OB Said What. All doctors come to the table and present their “evidence”. How do you know who is telling the truth, especially in a world where we’ve considered that doctors are capable of being flawed? Maybe it’s in the licensing of that title, to validate it. Most of the “Fed Uppers” are on a(n in)quest to end midwifery that does not belong to the CNM (certified nurse midwife) category. They believe that all other forms of midwife (usually designated as CPM, or certified professional midwife) are a joke and disservice to women. It needs to be noted here that a lot of this stems from personal bias and bad experiences or trauma the women have faced with natural birth. Differing regions (particularly in the States) have varied regulation in terms of education and practice standards, but in general, much training and years of education are required for one to become a licensed midwife of any title. Yet, one of the main purposes this group claims to promote is eradication of what they deem less qualified midwifery in favor solely of the CNM model. Unfortunately, CNM’s largely practice in birthing centers and in hospitals. What I see as the real goal in mind is the eradication of home birth. Is a midwife more qualified just for having gone to nursing school beforehand? Is a midwife more qualified for taking a more medical approach to birth? If no other midwife licensing is allowed or considered “qualified”, will that ensure everyone has more qualified care, or will it eliminate options and force women to choose between clinical birth and freebirth? Who gets to decide what kind of care a woman must receive, if not the woman herself? Who gets to mandate which one and only kind of education is valid and acceptable? What if midwifery as we know it became illegal? Maybe it’s in the current state of practice. Some argue that a midwife who refuses to renew her license recently is no longer a midwife and shouldn’t be allowed to practice. It doesn’t matter that her skills are still fresh in her memory, and that her choice to not renew is believed to be a political statement against mandating with whom and where women may give birth. To add controversy, suppose this midwife was unafraid of taking cases labeled “high risk” in order to give women more options for their labor, understanding the high risk cases could potentially result in a loss whether or not she presided over the care? If you knew a tragedy could be inevitable regardless, would you choose to stand by your patient, or would you CYA? Others would argue that an out-of-practice OB/GYN who’s been retired for almost 20 years now, although still given the title “Dr.”, is no longer up to date enough to be giving accurate medical advice, opinions, nor to be weighing in on birth today and facts presented by others who are more current and active in the field. Indeed, birth has changed a lot since the 1990’s. For better or for worse, the skills, policies, drugs, and technology would be greatly different. A doctor who stopped practicing back then, in this fast-paced profession, would undoubtedly be considered old school or maybe obsolete to the hospital crowd. Being fair, we could say that neither one has “lost” their skill set. Are either of them any less of a doctor or a midwife? Only in technicality. In our own minds, it’s up to our own judgment to ascertain this wisely. Who would you rather have– the latter, or the former– look after you? What would seem more “qualified” to you? I think education is nice, licenses, degrees, and titles are all very nice… but at the end of the day, it isn’t any one thing that promises to provide you with “qualified care”. Everyone is equally capable of incompetence. Truly understanding this leads to resigned acceptance of freedom to choose the care you think is best, without harsh judgment or scorn.